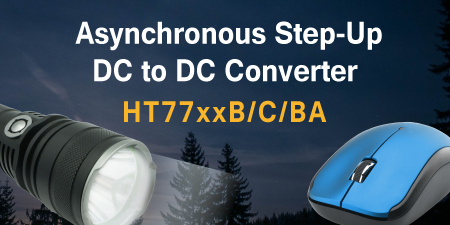 Holtek presently announces its new high-efficiency step up DC/DC converters/controller product series, the HT77xxB, HT77xxCand HT77xxBA. These devices use PFM techniques for their output control and have the benefits of extremely low operating current and low noise characteristics. By using an integrated low impedance power transistor, the HT77xxB and HT77xxBA series of devices only need to be connected to an external inductor, capacitor and diode to implement a complete DC/DC converter circuit, which can reach high-efficiency ratings of up to 85%, providing related applications with a low cost and minimal area DC/DC solution. An extra external power transistor can be used together with the HT77xxC to extend the maximum output current capability up to 350mA. The HT77xxB/C series are supplied in seven fixed output voltage types of 1.8V, 2.2V, 2.7V, 3V, 3.3V, 3.7V and 5V. The HT77xxBA series provides five fixed output voltage types of 2.7V, 3V, 3.3V, 3.7V and 5V. Their major advantage is in their ability to operate with a very low startup voltage of only 0.85V and in having a hold-on voltage of only 0.7V. When added to their extremely low supply current, this new range of devices can greatly extend battery life, making them suitable for widespread use in single or multi-cell Alkaline, Lithium Ion or Ni-MH battery powered portable applications such as remote controllers, wireless mouse/keyboards or 1W LED flashlights etc. Regarding packaging, the HT77xxB and HT77xxBA devices are available in TO92, SOT89-3, SOT23-3 and SOT23-5 package types while the HT77xxC devices are available in SOT89-3 and SOT23-5 package types. The SOT23-5 package type, with its additional chip enable pin, can control an internal power down function, which if the device is placed into this power down mode, enables it to consume an even lower reduced operating current of only 0.1μA.